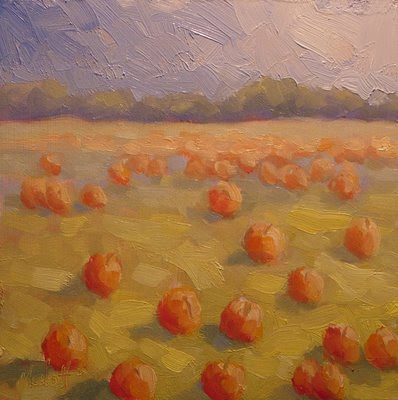 "Pumkins in the Field" I love the warm and cool colors in this painting. I really enjoy painting the fields of pumpkins this time of year. Probably more to come! This painting is 6"x6" oil on primed masonite artboard. Love this one, pity they don't have these here not such fields full of them at least. What a view that would be. The last paintings are all just awesome Heidi. Kind of yummy Heidi! Really nice series. Keep up the great work!